I love quick and easy meals. You know the ones I'm talking about, those meals that literally come together in minutes. No fuss, no muss. 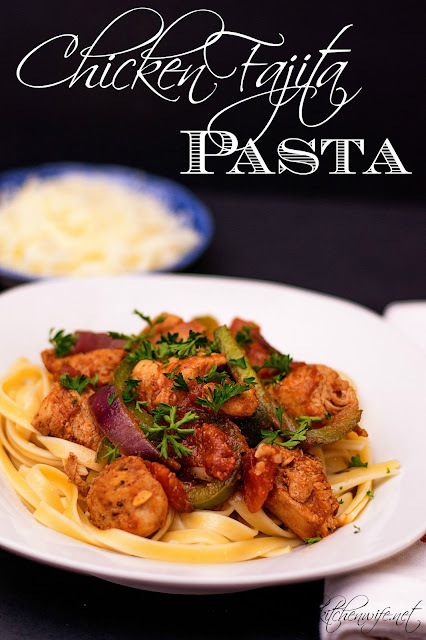 It's for that very reason that I ADORE this Chicken Fajita Pasta. Last week I had a couple of heavy blogging days and lost track of time. Studhubs was due home from work, and I had NO IDEA what I was going to make for dinner. So I found myself in the kitchen, staring at the fridge, lost. I had some chicken thawed, a green pepper that I needed to use up, a lemon (man I need to go to the store), and then it hit me! These are all the ingredients I would need for Chicken Fajitas! Only one problem was I didn't have tortillas. BUT, I DID have a TON of pasta and I thought "Why not, I'll make Chicken Fajita Pasta!" It took a little creativity, but oh my stars y'all! It was delicious and I cannot wait to share this one with you! To begin, place a large pot of salted water over high heat and bring to a boil. I usually add about a tablespoon of salt to my pot. Remember, this is the ONLY time you have to actually season the pasta. Now place a deep skillet over high heat and add the olive oil. While you are waiting for the pan to get hot you will season the chicken. Drizzle a little extra virgin olive oil over the cubed chicken in the bowl. Now add the chili powder, cumin, onion powder, garlic powder, and oregano. Give the chicken a toss so that everything is coated with the seasonings. By this time your water should be at a boil, and you can add the pasta. This dish is going to happen fast now. In the time it take for this pasta to cook, everything else will be ready! Cook the chicken for 4 minutes in the hot skillet. Let it get nice and brown. Now add the onions and green pepper. Let them cook for 3-4 minutes to get soft and tender. Now add the canned diced tomatoes to the pan, juice and all. Add the garlic and stir everything together. Since this is a pasta dish, you will want to create a bit of a sauce with the tomatoes. I like to add a 1/4 c. of water to the pan. This will help the tomatoes break down, reduce, and create a lovely sauce. Let the sauce simmer until the pasta has finished cooking, then finish by adding the lemon juice. As soon as the pasta has finished cooking you can place some on the plate, and then ladle the beautiful chicken fajita sauce over it! Oh how stunning is that! 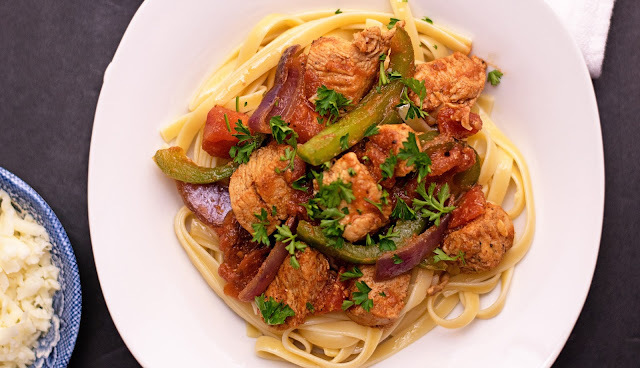 This Chicken Fajita Pasta is warm, spicy, hearty, and ready in under 30 minutes! I mean, does it really get any better than that!?! I love to have some shredded Monterrey Jack cheese to sprinkle on top, but other than that...This is truly pasta perfection! 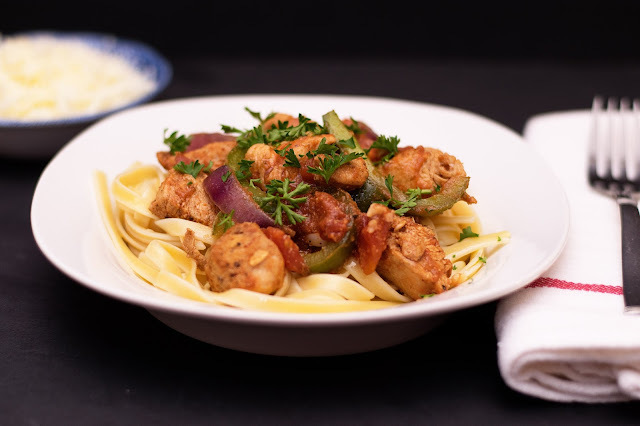 So try this Chicken Fajita Pasta a try tonight and I would love to hear what some of YOUR favorite, weeknight, pasta dishes are! Place a pot of salted water over high heat, and bring to a boil. Place a skillet over high heat and add the olive oil. Place the cubed chicken in a mixing bowl and add the salt, pepper, chili powder, cumin, onion powder, garlic powder, and oregano. Toss it all together so that all the chicken is coated in the seasoning. Add the fettuccine to the boiling salted water, and cook according to the directions on the box. Now add the seasoned chicken to the pan and cook for 4 minutes until golden brown. Now add the green pepper and onion to the pan. Cook 3-4 minutes. Add the canned diced tomatoes and garlic, and 1/4 c. water to the pan. Stir into the chicken, green pepper, and onion. Simmer in the pan until the pasta is finished cooking. Finish with the lemon juice, taste for seasoning and make any adjustments you feel it needs. Ladle over pasta, serve and ENJOY!